Since the theme of this week’s WordPress photo challenge is elemental, I thought I’d pull out a few more photos from my visit, earlier this year, to the lava flow from Kilauea’s Pu’u O’o vent. 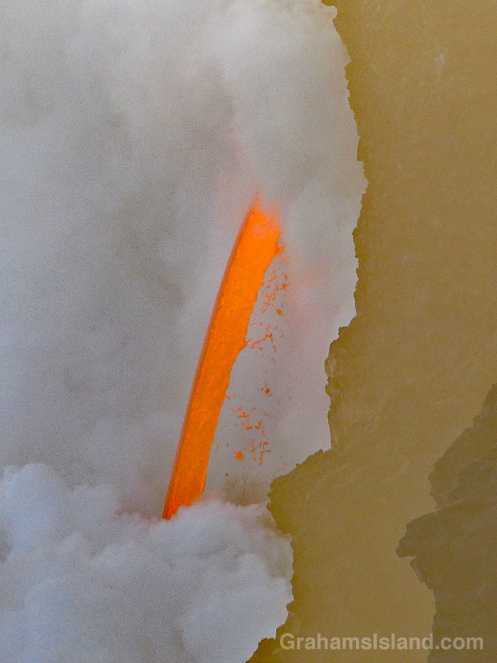 This is the closest we get to seeing fire from the earth’s core, a roaring torrent of molten lava. Since I took these photos there have been cliff collapses that have ended this firehose effect. 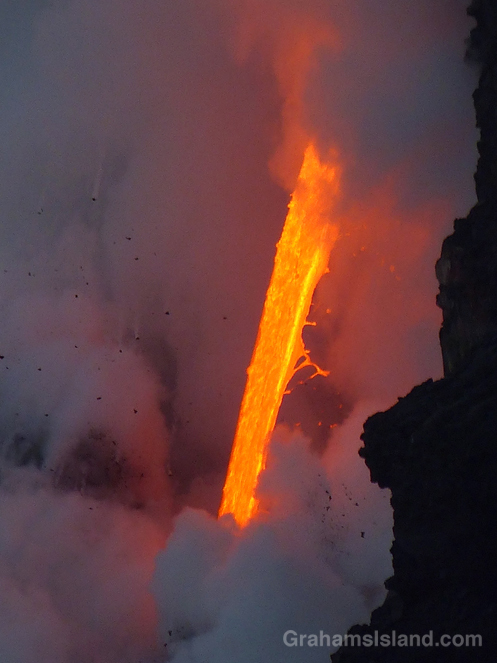 But the lava continues to flow and has formed a good-sized delta at the foot of the cliff. This delta is crossed by several large cracks, which run parallel to the coast. This means the whole delta is likely to collapse into the ocean in the near future, probably in explosive fashion. Could be time for another visit! Thanks. Always fun to see the volcano in action. Amazing. Not sure I would want to get too close myself but the elements of nature are powerful. It wasn’t that close, that’s the telephoto at work. The park tries to keep people from getting too close because the unstable nature of the ground makes it dangerous. It’s still an amazing sight and an absolute must see for anyone visiting. Spectacular photos, particularly the third one with the exploding cloud and the volcano illuminating the back. How close were you and could you feel the heat ? 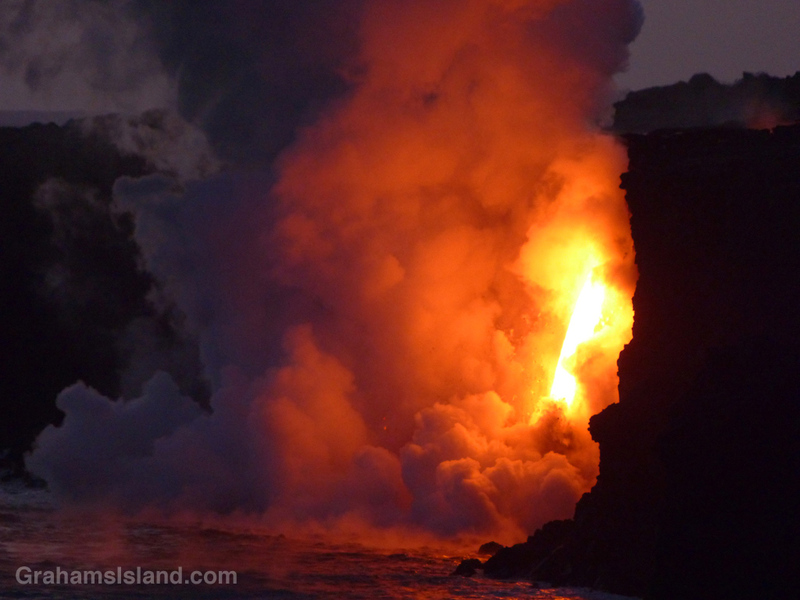 These were taking from the viewing area on the Kalapana side of the flow. I’m not sure how far away it is – maybe as much as half a mile, but the view was very good. 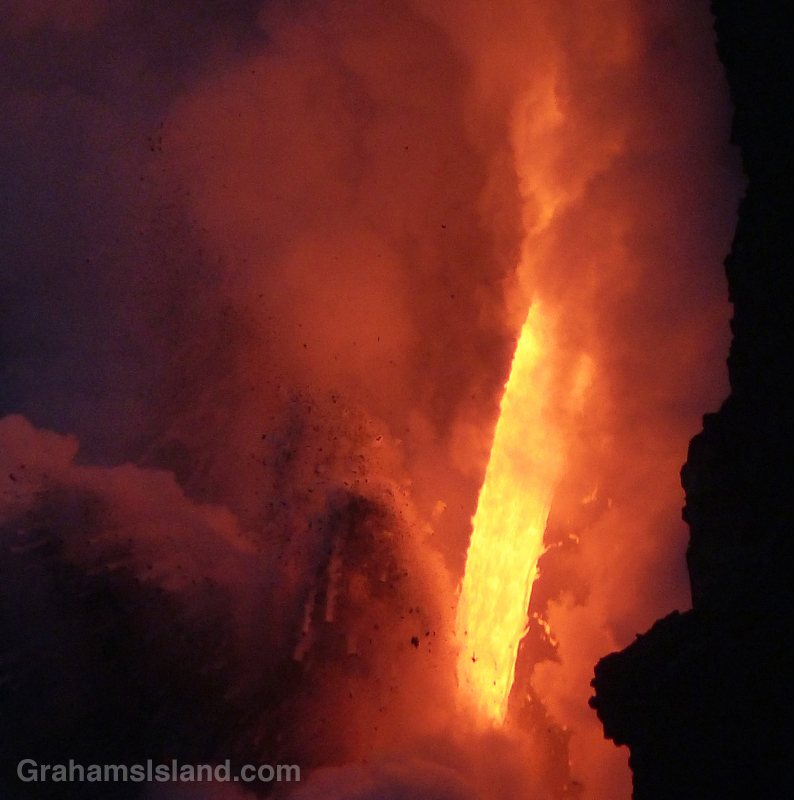 I didn’t feel the heat from there, but back when the lava first entered the ocean, I took a boat trip to see it from the water and the boat skipper put us in very close where it was very warm indeed. They’re not allowed to get that close anymore because the current delta is quite dangerous and liable to collapse at any time. 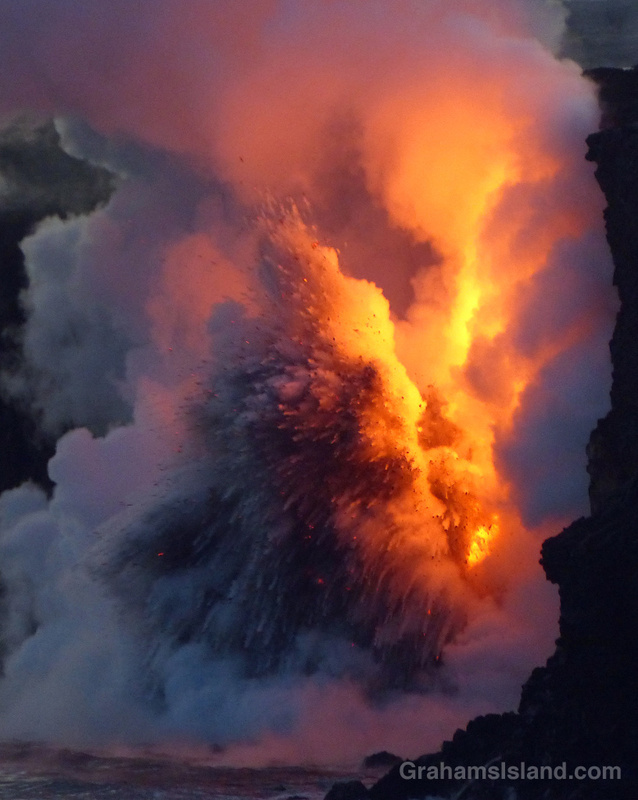 Such raw elemental power – how incredible to witness those scenes!! The sheer wonder of the immensity must have been so awesome. Thanks for stopping by. It really was awesome, and slightly unreal. The firehose was so uniform it was almost like it wasn’t moving, but the steam and explosions made it very clear it was.